A year ago, RCA gave each of the elementary school teachers an iPad to use in our classrooms! We were so excited to try these out. But, I’ve wanted a Smart Board since the first time I saw one, I just thought they were so cool and the possibilities seemed to be endless! A few weeks after we got the iPads, RCA gifted each of us with a projector to use with the iPads. While exploring ways to use them together, I stumbled upon Gynzy.com. Before I realized it was a paid subscription item, I fell in love with it. Now, I use it multiple times DAILY. Mostly for Mathametics, but I am slowly integrating other subjects as I go. I have made the $99 license fee the main thing on my Christmas Wish list this year! Gynzy is totally interactive with tons of manipulatives. Till now I have been using the Maps, Counting Money, the 100th Numbers Chart, Telling Time and Base Ten Blocks, and I know I’m only touching the tip of the ice-berg. The other day, I needed a slight time filler, and pulled up an Alphabetical order game that is on there. The kids LOVED it! Another thing I like is that it is web-based, so I can type up my lessons on the computer which is much easier than using the iPad touchpad, and save my whole lesson online within Gynzy. I really like that I can combine my input with the ready to use Gynzy activities I need for that lesson. AND then… I will be able to simply pull the whole lesson up the next year… WOW WOW WOW!!!! Another great feature is that you can print any page(s). So if you created a story web on there, but you had a student who was absent, you can print it up and put it with the absent work to help him/her with the assignment. In case you were wondering how best to use your interactive whiteboard with tablets, as it does not run in Safari, and there is not currently an app to run all of this. 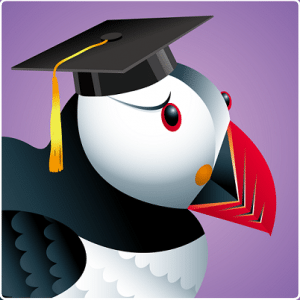 I use Puffin Academy to run Gynzy. Puffin Academy is another web browser, which you can simply download in Itunes or the PlayStore. It’s free to use, but only with certain educational websites, Gynzy.com is one of those. I think I gave you a good taste of how cool and easy gynzy.com is to use! I love it!